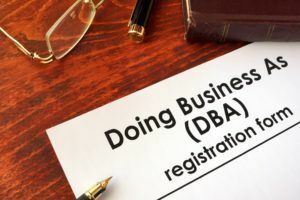 Doing Business As, or DBA, is simply operating a business using a name that is different from the name of the business owner. For some states, Doing Business As is also referred to as “Fictitious Name Filing” because it uses a fictitious name that is not the same as the legal name of the company if it is a corporationCorporationWhat is a corporation? A corporation is a legal entity created by individuals, stockholders, or shareholders, with the purpose of operating for profit. The creation involves a legal process called incorporation where legal documents containing the primary purpose of the business, name, and location. In most DBA cases, it can be seen that companies using the DBA method are sole proprietorships. Some business owners don’t want to use their own name on their business name and so they adopt DBA. However, if a businessman wishes to use his own name, then he doesn’t need to file for DBA. A Doing Business As is to be filed because the ownership of the business must be made clear to both the customers and the state. Should there be any issues that arise concerning the business, the customers have the right to know who they are transacting with. In some cases, a DBA is required by the bankRetail Bank TypesBroadly speaking, there are three main retail bank types. These are commercial banks, credit unions, and certain investment funds that offer retail banking services. Broadly speaking, all three types work towards providing similar banking services such as checking accounts, savings accounts, mortgages, debit cards, especially when a sole business owner wants to open a bank account. There are also instances when a client requires a contractor to file a DBA when bidding in order to get a projectProject ManagementProject management is designed to produce an end product that will make an impact on an organization. It is where knowledge, skills, experience, and. In case a company is expanding its business to areas that are not covered by the current business name, a DBA is required. For example, if the current name it carries is “Jane’s Wedding Couture” and it wants to expand its reach to include many other party clothes, then it will need to file a DBA. in such a way, customers will know that it isn’t just all about wedding gowns. It is important for business owners to understand that various states in the US follow different procedures regarding filing for a DBA. The process may be simple or complex, with some states simply requiring business owners to head to the nearest country clerk, register their fictitious name in the registry, and pay a license fee of $10 to $100. An identification number is required when filing a DBA which is used for filing business tax. Using one’s Social SecuritySocial SecuritySocial Security is a US federal government program that provides social insurance and benefits to people with inadequate or no income. The first Social Security Act was signed into law in 1935 by President Franklin D. Roosevelt. The law underwent several modifications over the years to include several social welfare Number is not advised because it exposes the owner to identity theft. Some states do not require registration of fictitious names but it can pose a problem, especially if there is a duplication of names. Therefore, it is for the safety of everybody to get their fictitious name registered. With technology advancement, online registration is already possible wherein the form filed gets scanned for errors before being submitted to the right agency. Furthermore, some states require that the fictitious name is advertised in the local paper and that the owner submits an affidavit, confirming the completion of requirements for Doing Business As. When a fictitious name is registered or filed for DBA, the name needs to be registered with the U.S. Patent and Trademark Office, as well as with the Secretary of State. By doing so, the trademark rights of the name are given to the owner. A great amount of privacy. Of course, when a business owner’s name is not used in its company’s name, then there is a lot of privacy to be enjoyed. Expand the business. With DBA, it is much easier for business owners to expand their business’ coverage or try to enter a new market. More value and attractiveness. If one names his ice cream business with his own name such as in “Peter Gallen’s Ice Cream House,” it would not sound as delicious and attractive as calling it “Cold and Creamy Ice Cream,” right? ProspectusProspectusA prospectus is a legal disclosure document that companies are required to file with the Securities and Exchange Commission (SEC). The document provides information about the company, its management team, recent financial performance, and other related information that investors would like to know. US – EDGARUS - EDGAREDGAR is a database where U.S. public companies file regulatory documents such as annual reports, quarterly reports, 10-k, 10-q, prospectus and more. EDGAR stands for Electronic Data Gathering, Analysis & Retrieval and is a searchable database of filing documents for U.S. companies.